Buy a Babolat racquet, get $25 off a pair of Babolat shoes, free stringing, and free shipping! Valid only 11/21-11/28. 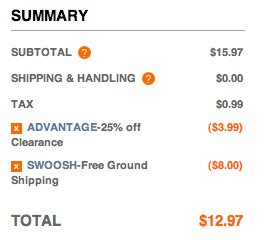 Sports Authority (SOLD OUT) is also having a 25% OFF any one item* sale with this printable coupon. (Exp Nov 22) These sales end soon, so hurry in to avoid the big rush before Black Friday! *Note: Exclusions apply. Please check site for full details.